The Linea Bed offers an unparalleled mix of fashion and function, and for good reason. The bed's linear open-air headboard and Scandinavian modern design help make the piece a great choice in contemporary and traditional bedrooms. 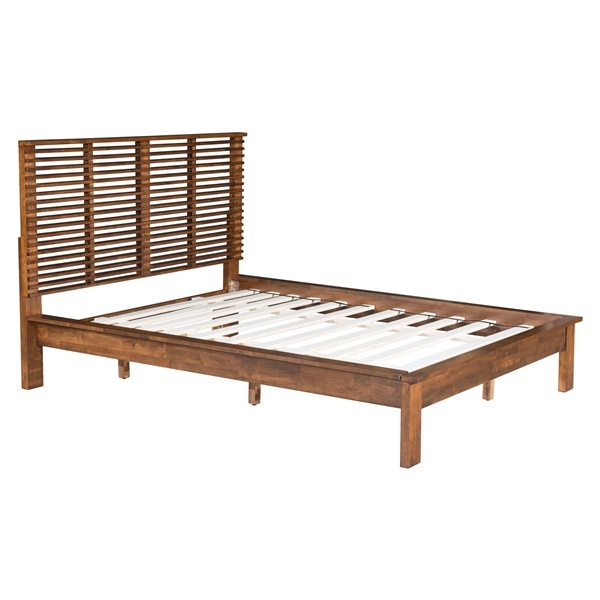 Meanwhile, the bed's frame and support planks consist of solid wood for exceptional strength and durability. Rest comfortably night after night thanks in part to a top-notch bed � the Linea Bed. what is the measurement of the base (where the mattress sits) to the floor? It's not clear to me from the measurements given which measurements are the headboard etc. can you please provide all measurements? The height of the base where the mattress sits is 14.6" The overall width is: 67" (Queen) / 83" (King) The overall depth is: 85.5" (from headboard to footboard) The height of the headboard is: 47.3"
What kind of wood is this? Is it solid wood? The Linea Bed is made of solid fir wood, finished in a walnut color.